Hand made pocket spring divan beds, mattresses and headboards made by the leading pocket spring bed company in the UK are now available to buy at Harvest Moon. 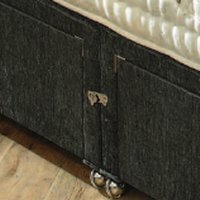 So if you are looking for a Vi-Spring or Hypnos pocket spring bed or a Pocket Spring Bed Company bed, take a look here at ours, rather more bed for rather less! There are 6 sumptuous beds in the range, the Winchcombe 7000, Tetbury 5000, the Tewksbury 3000, the Stow 2000, the Chipping 1500 and Cornberry 1000. Each bed or mattress is made bespoke to your individual order. The image below shows the Tetbury 5000 pocket spring divan bed with 4 storage drawers along with a Willis and Gambier Ivory headboard all border="0" on display in our Southport furniture showrooms. The collection incorporates individual pocket springs with active support technology in the mattress, each mattress is meticulously made with a lavish layer of pure white cashmere, silk, wool, cotton, mohair and horse hair. These superior fillings provide maximum comfort for an amazing night's sleep. The image above shows an exploded side view of the support you only get from a high quality pocket spring bed. The whole bed is upholstered in the highest quality damask so as to maximise the feel of these natural fillings. All the mattresses are hand tufted with woollen tufts and have five handles on a four tier stitched border. Bases are upholstered to the highest possible standard with linking bars and shepherd castors. The range comes as standard in a medium comfort specification but a firmer tension is also available along with dual tensions i.e. you can have one side with a medium tension and the other firm - ideal for couples of different sizes / weight. Storage drawers are available as an optional extra. 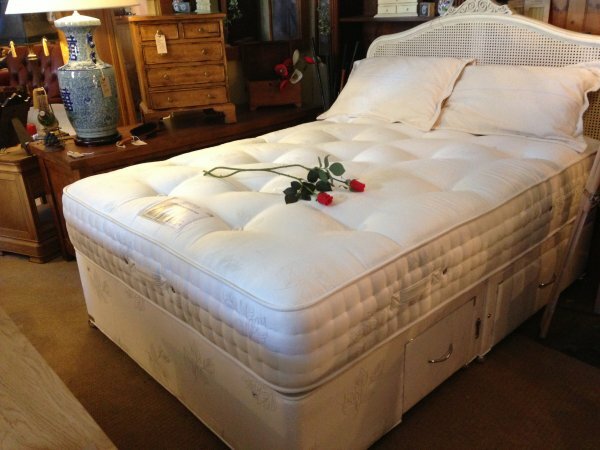 All mattresses are turnable and can be ordered on their own. All bases come as standard with a platform base which is fine, if you prefer the full luxury experience an optional upgrade to the 1000 pocket sprung edge base is available at extra cost. We offer the Cotswold divan beds in the following sizes: single bed, double bed, king size bed and lastly as a super king size bed. The Cotswold Pocket Springs beds range is all hand finished in the UK in the same traditional method of construction as that of the Pocket Spring Bed Company, however, by way of comparison all the beds featured here are 30% less than the Pocket Spring Bed Company equivalent. We offer a rapid 14 to 21 days two man home delivery to UK mainland addresses on all Cotswold Pocket Spring bed orders! For complete divan beds the cost is £60 and for just a mattress it is £40. 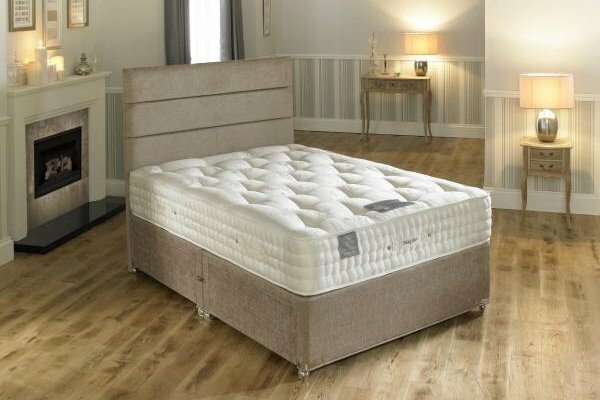 The Cotswold Pocket Spring Winchcombe 7000 bed is the top of the range and has 7000 heat treated posture pocket springs with active technology that allows your muscles to relax in a more natural sleep position. The Winchcombe 7000 bed is hand tufted with woollen tufts and each mattress is made with a lavish layer of pure white cashmere, silk, wool, cotton, mohair and horse hair. The 7000 spring mattress is 36cm deep and has 5 durable and high quality spring layters. The high quality springs will last longer than in a traditional single layer mattress as the multiple layers ensures that each individual spring support less weight. 2000 Core Spring Layer - This central layer of springs gives core stability across the whole width of the mattress. 1500 Comfort Spring Layers - The two layers of 1500 springs adapt and move to cope with your smaller movements throughout the night. 1000 Micro Spring Layers - These micro springs act as a replacement for a pillow top. This outer layer is breathable and reduces the chance of allergens and dust-mites formings and is designed to resist to sagging and settlement. All the beds in the range have a turnable mattress. 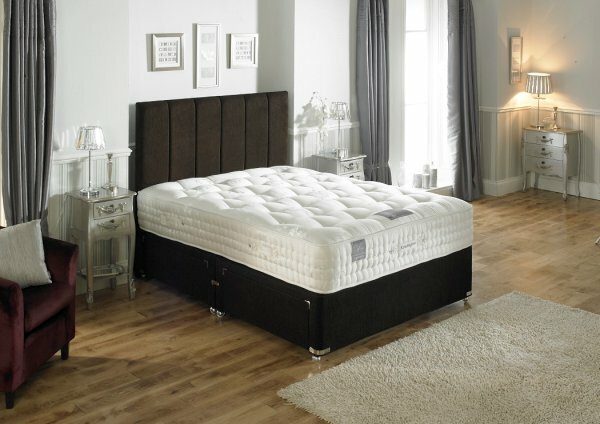 Choose between a standard platform base or with a 1000 pocket sprung edge enhancing the sleeping experience. The Cotswold range comes as standard in a medium comfort specification but a firmer tension is also available as is a dual tension option. The Cotswold Pocket Spring Winchcome bed is shown in the image below upholstered in aubergine fabric with a Dorchester floor standing headboard also in aubergine fabric (note the headboard is not included). 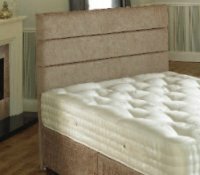 All Cotswold Pocket Spring divan beds are supplied as a divan bed base and mattress set, you can also buy a mattress on its own. Storage drawers available as optional extra. Headboard not included. See the bottom of the page for headboard, mattress, divan bed base and fabric options. The Tetbury 5000 bed is hand tufted with woollen tufts and each mattress is made with a lavish layer of pure white cashmere, silk, wool, cotton, mohair and horse hair. It has 5000 heat treated posture pocket springs with active technology that allows your muscles to relax in a more natural sleep position. The coils adjust instantly to you sleep movements, comforting and supporting your body actively. The 5000 spring mattress is 33cm deep and has 3 durable and high quality spring layters. The high quality springs will last longer than in a traditional single layer mattress as the multiple layers ensures that each individual spring support less weight. The Tetbury has superior Damask fabric with five flag stitched mattress handles on a new four tier stitched border. The Cotswold Pocket Spring Tetbury bed is shown in the image below upholstered in steel fabric with a Dorchester floor standing headboard also in steel fabric (note the headboard is not included). Storage drawers available as optional extra. Headboard not included neither is the Willis and Gambier Ivory as shown in the image below. See the bottom of the page for headboard, mattress, divan bed base and fabric options. The Tewksbury 3000 bed has 3000 heat treated posture pocket springs with active technology that allows your muscles to relax in a more natural sleep position. 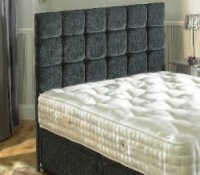 The Tewksbury 3000 is hand tufted with woollen tufts and each mattress is made with a lavish layer of pure white cashmere, silk, wool, cotton, mohair and horse hair. 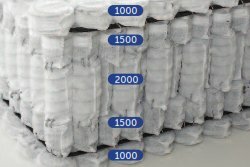 The 3000 spring mattress consists of 2 layers of 1500 high quality springs giving a 33cm deep mattress. The Tewksbury has superior Damask fabric with five flag stitched mattress handles on a new four tier stitched border. The Cotswold Pocket Spring Tewksbury bed is shown in the image below upholstered in dark brown fabric with a Cambridge floor standing headboard also in dark brown fabric (note the headboard is not included). The Stow 2000 bed has 2000 heat treated posture pocket springs with active technology that allows your muscles to relax in a more natural sleep position. The Stow 2000 is hand tufted with woollen tufts and each mattress is made with a lavish layer of pure white cashmere, silk, wool, cotton, mohair and horse hair. The Stow has superior Damask fabric with five flag stitched mattress handles on a new four tier stitched border. The Cotswold Pocket Spring Stow bed is shown in the image below upholstered in stone fabric with a Banbury floor standing headboard also in stone fabric (note the headboard is not included). 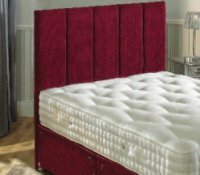 /All Cotswold Pocket Spring divan beds are supplied as a divan bed base and mattress set, you can also buy a mattress on its own. 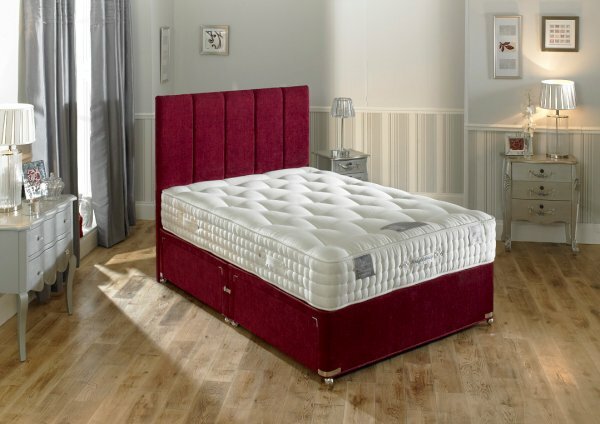 The Cotswold Pocket Spring Chipping 1500 divan bed has 1500 heat treated posture pocket springs with active technology that allows your muscles to relax in a more natural sleep position. The Chipping pocket spring divan bed has all the same features as the rest of the collection the only difference being the number of pocket springs. See models detailed above for full details. The Cotswold Pocket Spring Chipping bed is shown in the image below upholstered in burgundy fabric with a Cambridge floor standing headboard also in burgundy fabric (note the headboard is not included). 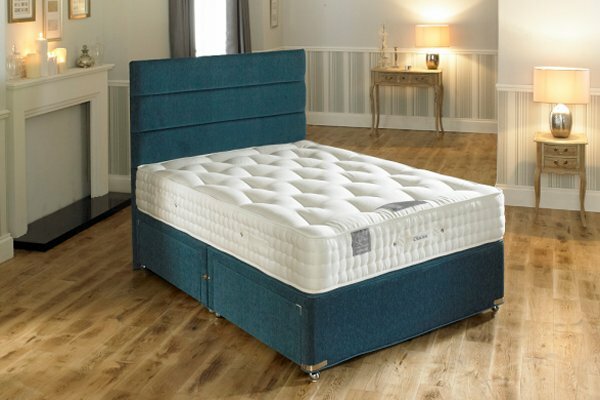 The last model in the Cotswold Pocket Spring range is the Cornberry 1000 bed which has 1000 heat treated posture pocket springs with active technology that allows your muscles to relax in a more natural sleep position. The Cornberry pocket spring divan bed has all the same features as the rest of the collection the only difference being the number of pocket springs. See models detailed above for full details. The Cotswold Pocket Spring Cornberry bed is shown in the image below upholstered in teal fabric with a Banbury floor standing headboard also in teal fabric (note the headboard is not included). All the Cotswold pocket spring mattresses are available to order on their own. 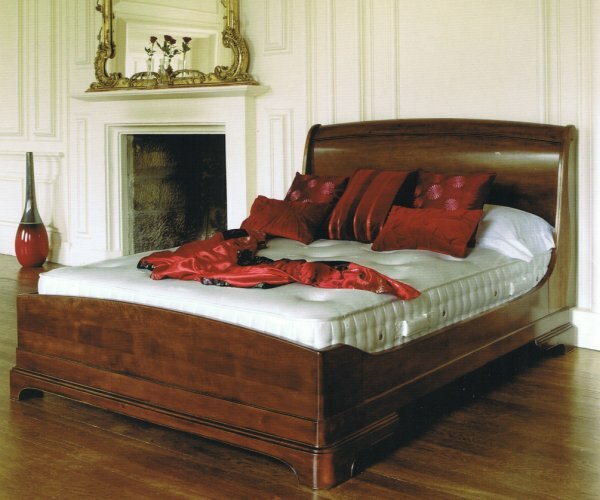 The image above shows a Cotswold 5ft Tetbury mattress on a Willis and Gambier Lille bedstead. 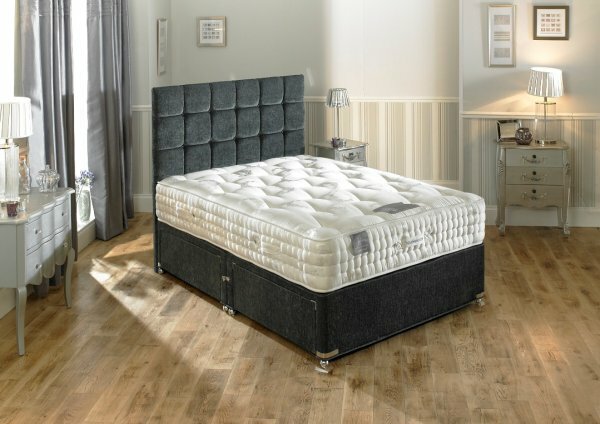 Each of the mattresses is a turnable mattress and comes as standard in a medium comfort specification, a firmer tension is available for an extra 15% on top of the standard prices and a dual tension option is available for an extra 20% on top of the standard prices. All bases come as standard with a platform base which is fine, if you prefer the full luxury experience an optional upgrade to the 1000 pocket sprung edge base is available for an extra £245 on top of the standard platform base bed price. For prices and more details of each the 6 Cotswold Pocket Spring mattresses see the bed models listed above. Choose from 3 stylish headboard designs - the Dorchester, Banbury and Cambridge all of which are traditionally hand made to exacting standards and are available either as a floor standing headboard, as shown, or the standard 70cm high headboard with a standard divan fixing in a choice of upholstery options that are detailed further below. 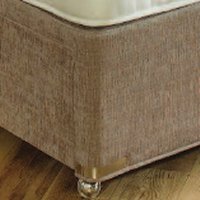 The Cotswold divan bed bases and headboards are available of upholstery options which can be seen in the swatch images below. 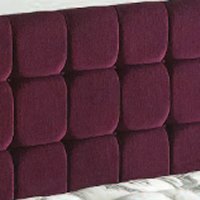 The image below shows the Dorchester headboard upholstered in aubergine fabric, the next image shows a divan bed base upholstered in stone fabric and lastly the steel fabric option is shown on a divan bed base.